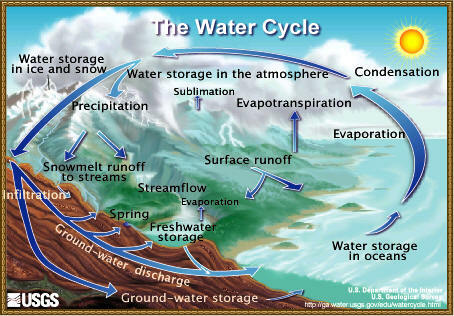 The role of rainforests in the water cycle is to add water to the atmosphere through the process of transpiration (in which plants release water from their leaves during photosynthesis). This moisture contributes to the formation of rain clouds, which release the water back onto the rainforest. In the Amazon, 50-80 percent of moisture remains in the ecosystem’s water cycle. In recent years, the rainforests of Borneo and the Amazon have experienced very severe droughts. These have been made worse by deforestation. Moisture generated by rainforests travels around the world. Scientists have discovered that rainfall in America’s Midwest is affected by forests in the Congo. Meanwhile, moisture created in the Amazon ends up falling as rain as far away as Texas, and forests in Southeast Asia influence rain patterns in southeastern Europe and China. Distant rainforests are therefore important to farmers everywhere.